This page Roman Empire is part of the Ancient Rome series. The Roman Empire was the post-Roman Republic period of the ancient Roman civilization, characterized by government headed by emperors and large territorial holdings around the Mediterranean Sea in Europe, Africa and Asia. 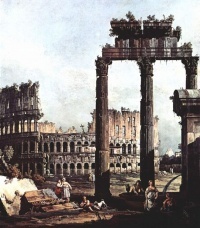 The city of Rome was the largest city in the world c. 100 BC - c. AD 400, with Constantinople (New Rome) becoming the largest around AD 500, and the Empire's populace grew to an estimated 50 to 90 million inhabitants (roughly 20% of the world's population at the time). The 500-year-old republic which preceded it was severely destabilized in a series of civil wars and political conflict, during which Julius Caesar was appointed as perpetual dictator and then assassinated in 44 BC. Civil wars and executions continued, culminating in the victory of Octavian, Caesar's adopted son, over Mark Antony and Cleopatra at the Battle of Actium in 31 BC and the annexation of Egypt. Octavian's power was then unassailable and in 27 BC the Roman Senate formally granted him overarching power and the new title Augustus, effectively marking the end of the Roman Republic. The imperial period of Rome lasted approximately 1,500 years compared to the 500 years of the Republican era. The first two centuries of the empire's existence were a period of unprecedented political stability and prosperity known as the Pax Romana, or "Roman Peace". Following Octavian's victory, the size of the empire was dramatically increased. After the assassination of Caligula in AD 41, the Senate briefly considered restoring the republic, but the Praetorian Guard proclaimed Claudius emperor instead. Under Claudius, the empire invaded Britannia, its first major expansion since Augustus. After Claudius' successor, Nero, committed suicide in AD 68, the empire suffered a series of brief civil wars, as well as a concurrent major rebellion in Judea, during which four different legionary generals were proclaimed emperor. Vespasian emerged triumphant in AD 69, establishing the Flavian dynasty, before being succeeded by his son Titus, who opened the Colosseum shortly after the eruption of Mount Vesuvius. His short reign was followed by the long reign of his brother Domitian, who was eventually assassinated. The Senate then appointed the first of the Five Good Emperors. The empire reached its greatest extent under Trajan, the second in this line. A period of increasing trouble and decline began with the reign of Commodus. Commodus' assassination in 192 triggered the Year of the Five Emperors, of which Septimius Severus emerged victorious. The assassination of Alexander Severus in 235 led to the Crisis of the Third Century in which 26 men were declared emperor by the Roman Senate over a fifty-year time span. It was not until the reign of Diocletian that the empire was fully stabilized with the introduction of the Tetrarchy, which saw four emperors rule the empire at once. This arrangement was ultimately unsuccessful, leading to a civil war that was finally ended by Constantine I, who defeated his rivals and became the sole ruler of the empire. Constantine subsequently shifted the capital to Byzantium, which was renamed "Constantinople" in his honour. It remained the capital of the east until its demise. Constantine also adopted Christianity which later became the official state religion of the empire. This eastern part of the empire (modernly called "Byzantine Empire") remained one of the leading powers in the world alongside its arch-rival the Sassanid Empire, which had inherited a centuries-old Roman-Persian conflict from its predecessor the Parthians. Following the death of Theodosius I, the last emperor to rule a united Roman Empire, the dominion of the empire was gradually eroded by abuses of power, civil wars, barbarian migrations and invasions, military reforms and economic depression. The Sack of Rome in 410 by the Visigoths and again in 455 by the Vandals accelerated the Western Empire's decay, while the deposition of the emperor, Romulus Augustulus, in 476 by Odoacer, is generally accepted to mark the end of the empire in the west. However, Augustulus was never recognized by his Eastern colleague, and separate rule in the Western part of the empire only ceased to exist upon the death of Julius Nepos, in 480. The Eastern Roman Empire endured for another millennium, eventually falling to the Ottoman Turks in 1453. The Roman Empire was among the most powerful economic, cultural, political and military forces in the world of its time. It was one of the largest empires in world history. At its height under Trajan, it covered 5 million square kilometres. It held sway over an estimated 70 million people, at that time 21% of the world's entire population. The longevity and vast extent of the empire ensured the lasting influence of Latin and Greek language, culture, religion, inventions, architecture, philosophy, law and forms of government on the empire's descendants. Throughout the European medieval period, attempts were even made to establish successors to the Roman Empire, including the Empire of Romania, a Crusader state, and the Holy Roman Empire. By means of European colonialism following the Renaissance, and their descendant states, Greco-Roman and Judaeo-Christian culture was exported on a worldwide scale, playing a crucial role in the development of the modern world. Unless indicated otherwise, the text in this article is either based on Wikipedia article "Roman Empire" or another language Wikipedia page thereof used under the terms of the GNU Free Documentation License; or on original research by Jahsonic and friends. See Art and Popular Culture's copyright notice. This page was last modified 17:03, 10 July 2017.